School has started here in Baldwin City and I am back to teaching at the University of Kansas. It seems that summer is almost over once the kids return to class, but there is still quite a bit of harvesting to do before the first frost. 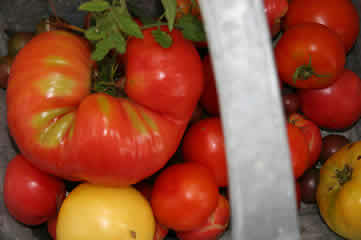 Many of my tomatoes still haven't turned red yet, in large part because of the heavy rains and mild summer. 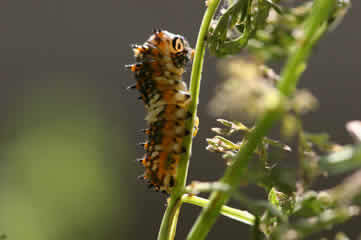 Butterflies and moths are quite active and many plants are still blooming. 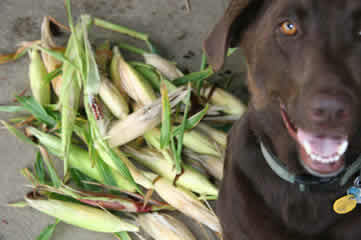 I harvested some corn yesterday and Hank the Tank insisted on standing in front of the camera. The darker cobs are from Potawatomie kernels. 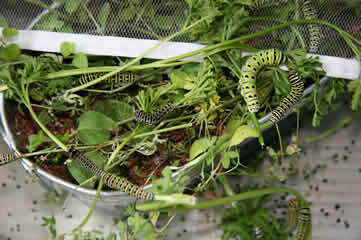 These Swallowtail caterpillars are now inside my basement. Their home consists of three small pots of various herbs sitting inside a large plastic tub and a butterfly dome on top of that so they can crawl on the mesh when they want to metamorphose. 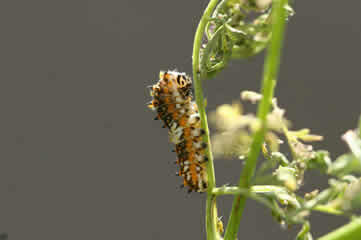 Although they ate the oregano and dill, they prefer parsley, carrot and fennel. 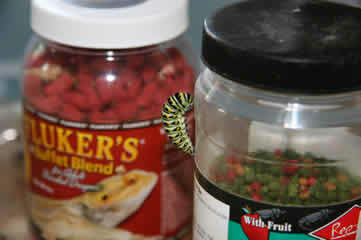 This guy escaped and found that Draco the Bearded Dragon's crunchy food jar is a nice place to undergo his/her metamorphosis. 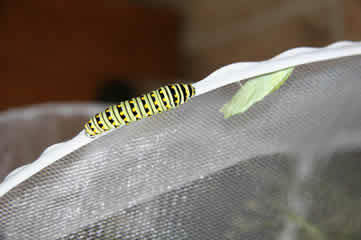 A Swallowtail caterpillar and a chrysalis inside the netting. 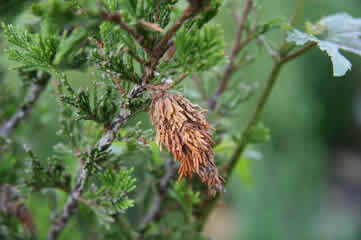 I spotted this bagworm yesterday slowly crawling along a branch off our back deck. 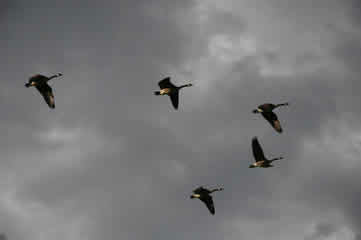 These pests make bags/nests with the foliage and if they arrive on your property in large numbers can kill trees. Basic advice includes cutting them from the branches and throwing them away. I have also read that planting daisies nearby and introducing ichneumonid wasps (a natural predator) also work in eradicating them. I need more info about those wasps, however. 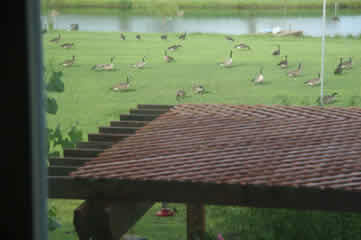 Here is a shot of a flock of geese in the backyard. 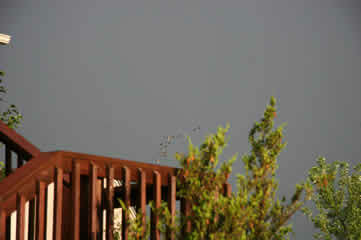 He's too small to see clearly, but that is a hummingbird at the feeder under the arbor. I got some nice tomatoes this weekend. The large funky one looks as if three have grown together. 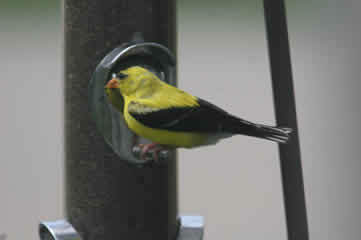 A Yellow Finch visits the thistle seed feeder. 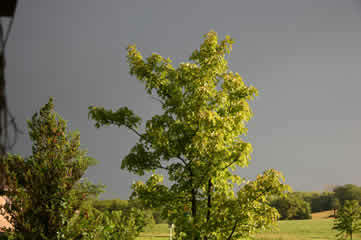 Below: Impending storm over Baldwin City. Last week a bolt hit our driveway and followed the rebar into the garage where it zapped my truck then blew the circuit breaker switches. It then fried the garage door motors, phones, satellite, computer modems, and various other smaller items such as the coffee pot and nightlights. Above and below: I'm not sure what sort of caterpillar this guy is, but he was the only one of his kind to hang around with the Swallowtail cats.